Pousson Family Dentistry "Serving Slidell since 1979"
If you delay dental visits, stress the day of your appointments, or have a sensitive gag reflex, you might be an ideal candidate for sedation dentistry. Sedation is also helpful if your mouth does not become numb with local anesthetic, or if laughing gas is ineffective on you. If you need several dental procedures completed in a short amount of time, sedation dentistry should also be considered. Dr. Pousson often combines oral sedation with nitrous oxide (laughing gas) to help patients remain fully relaxed throughout their visit. Gum disease afflicts about half of the U.S. population, and it has been linked to severe health complications, ranging from stroke and heart attack to diabetes complications and Alzheimer’s disease. It is also the main cause of tooth loss for adults. To treat this invasive and chronic infection of the periodontal tissues, Dr. Pousson and our team perform non-surgical gum treatments. We will also design a treatment plan that deters the condition from returning in the future. If your oral health is significantly compromised, you may live with pain, poor self-confidence, reduced quality of life, and a limited diet. With advanced dental care, you can reclaim a fully restored smile, free of disease, decay, and infection. Dr. Pousson offers full mouth reconstruction, a comprehensive, phased treatment plan that addresses all of a patient’s oral health issues. Treatment will focus on building a healthy, strong, and solid foundation for your long-term oral health. Your full mouth reconstruction will be completely customized to restore your teeth and bite. Missing teeth impair the ability to comfortably speak and eat, and they can also make a person feel self-conscious about their appearance. Dr. Pousson offers traditional bridges, partials, and dentures. However, the restorative option that most closely mimics nature’s design is the dental implant. Each implant replaces a tooth root once it has fused with the jawbone. We can attach a single crown to an implant, or a few implants can secure a denture, partial, or bridge. We also offer the innovative All-on-Four® procedure to stabilize dentures. When poor oral health or injury claim most or all of a person’s natural teeth, Dr. Pousson often suggests dentures. Modern dentures look and feel more natural than previous generations, and they allow a person to eat, speak, and smile just as if they have a full set of healthy, natural teeth. We can secure dentures with adhesive on the top and bottom arches, or with a closed-palate denture and natural suction on the top arch. However, many patients opt for the more secure and long-lasting option of dental implant-supported dentures. When internal infection threatens the health of a tooth, the only options are extraction or root canal therapy. With innovative sedation options and precision tools, root canal therapy is now more comfortable and effective than ever. Dr. Pousson uses microtools with rotary power to precisely and completely clean infection from within a damaged tooth, enabling the patient to retain the natural tooth instead of requiring extraction. Most root canal treatments are completed in a single visit. Dental crowns are restorations that protect a tooth weakened by decay, chips, or fractures. Crowns provide more structural stability than a dental filling since they fit over the entire portion of a tooth above the gum line. For teeth that show when you smile, Dr. Pousson prefers to use all-porcelain crowns. Teeth that sustain more biting force, the premolars and molars, require porcelain fused to metal, all-metal, or zirconia crowns. At your consultation, Dr. Pousson will explain the advantages of each type of crown so that you can make an informed treatment decision. Replacing missing teeth is imperative to maintaining good oral health. A dental bridge is a prosthetic device that consists of one, two, or three fake teeth, with a crown on either end. The crowns hold the bridge securely in place, so it becomes a fixed part of the patient’s smile. Bridges can also be anchored to dental implants, instead of crowns. Contemporary bridges are designed to blend seamlessly with surrounding teeth. Dr. Pousson prefers all-porcelain or zirconia bridges for optimal aesthetics. Only one percent of humans avoid developing a cavity during their lifetime. Left untreated, areas of decay will worsen and can ultimately cause tooth loss or a painful internal infection. To restore a decayed tooth, we can place tooth-colored, metal-free, composite resin dental fillings. We also offer amalgam fillings, which are more likely to be covered by insurance when placed in the back teeth. A filling requires just one visit to complete the entire procedure. In many cases, Dr. Pousson can also replace your existing amalgam fillings with composite resin. Our full scope of preventive dentistry covers all aspects of disease prevention. At dental checkups, we will examine your mouth, gums, jaw joints, head, and neck, as well as existing dental work. A regular dental cleaning entails removing plaque and calcified tartar from between the teeth and at the gum line. Most patients need checkups and cleanings every six months, though three-month visits are recommended for some. In addition, we can teach you how to optimize your dental care at home. Disorders of the temporomandibular joint (TMJ), which connects your jawbone to your skull, can cause pain and make chewing difficult. Based on x-rays and a physical exam, we can provide a swift diagnosis of your symptoms. 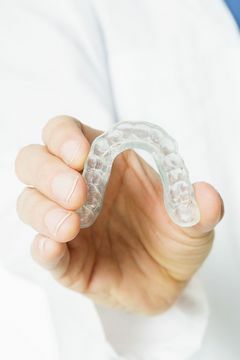 If Dr. Pousson believes that they result from misaligned jaw joints, he will fit you for an oral splint or nightguard. These devices keep the lower jaw in proper position while you sleep, allowing muscles to relax and alleviating many symptoms. TMJ appliance therapy also prevents the wear and damage caused by clenching the teeth. Dr. Pousson has performed a large number of extractions, including the removal of impacted teeth. While our primary goal is to save your natural teeth, in some cases, extraction is necessary. For instance, we sometimes extract teeth in preparation for orthodontics to correct crowding. Extraction is often a prerequisite for full dentures when only a few teeth remain in the mouth. Third molars, or wisdom teeth, can be removed as a preventive measure, before they erupt, or in adulthood, when they are fully developed. Please feel free to give us a call if you have a question or would like to schedule an appointment. We want to be your friendly, professional dental practice in Slidell!